The Eventful Company owns AuctionMaestro Software, through MaestroSoft, which is the Premier Provider of Event Management Software in the Country. AuctionMaestro offers the most comprehensive Event Management solution for the not-for-profit consumer. Our clients have the distinct advantage of attaining a one-year license to use this software for a very nominal fee. AuctionMaestro event management software has been the best, most efficient program we have used for our clients. After much research, The Eventful Company found that this software has the widest array of options and capabilities for event management. Because we purchased use of this software and have gained many years of experience in the program, we are able to create a very proficient system and environment for all of our clients. The Eventful Company will be pleased to present an AuctionMaestro demo to you and your organization so you can determine if this is a great fit for your organization’s event. Although AuctionMaestro has a seemingly endless list of options and benefits for our clients, the following are some of the most beneficial features to our clients. These capabilities allow us to enter all of the information of your guests, auction items, table seating set-up, and much more, before the event even begins. This means that when the event does start, everything will be set up and ready. This creates a smooth, professional, and very organized atmosphere. Our company has a very organized and productive system in place, thanks to our use of MaestroSoft’s AuctionMaestro software. 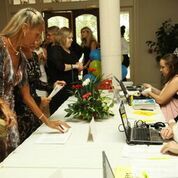 We are able to check all of our client’s guests in and out quickly, and manage every event purchase in real time. Although these are our most typical uses of AuctionMaestro’s program during the event, we can almost always accommodate any other client request through AuctionMaestro. These are just a couple of the cumulative ways AuctionMaestro allows clients to see how much money was raised, and what auction items sell well during an event. These are incredibly helpful in planning our clients’ next events.